As an herb, valerian is an olfactory contradiction. It's been used as a medicinal herb for centuries, but it's most distinctive feature is its scent. You may love the way valerian smells, but if you do, you're in the minority. Most people who get a whiff of a valerian blossom think it smells a bit like cherry-vanilla (maybe). The surrounding leaves and stems contribute a definite musty, sour, almost rank odor, though, so the overall effect is generally unpleasant. Still, one common historical use for valerian was in perfumery, so it must have something going for it. It's probably still used in some complex perfume recipes today. Perfumes can have hundreds of ingredients, and some of them are bound to be pretty unique. Where the plant may smell just marginally tolerable when it's in heavy bloom, the roots definitely smell nasty moldy, and it's the root that's most often dried, powdered and used in herbal preparations. I can picture valerian in a woodsy/swampy setting where layers of tree leaves are slowly decaying under fallen branches while mushrooms sprout nearby. It's that kind of smell. If you think I'm exaggerating, some word origin experts believe that the word "phew" (for a stinky smell) came from the writings of Dioscorides, a Roman physician in the first century A.D. who called valerian "phu." That seems a bit on the nose to be completely true, but it's a great story. What valerian lacks in sweet perfume, it makes up for in herbal benefits, though. It's probably the premier sleep aid on the herbal market, and can also be useful as a tranquilizer and anti-depressant. If you think life stinks because you can't catch the zzzzs you need, then valerian may deserve a place in your garden. A tall perennial, valerian (Valeriana officinalis) produces clusters of (usually) white flowers that attract butterflies and bees. It offers a nice screen for the back of an herb patch, especially if grown near a fence or other support. Provide valerian with full sun for at least 6 hours a day. It likes a nitrogen rich soil that drains well and appreciates plenty of moisture. I maintain my plants on a low spot in the garden that tends to pool -- briefly-- after a heavy rain. Valerian can grow to about 5 feet high and more than a foot across, so give it plenty of space. It is hardy in zones 4 through 9. Treat valerian respectfully by giving it a layer of mulch spring and fall. 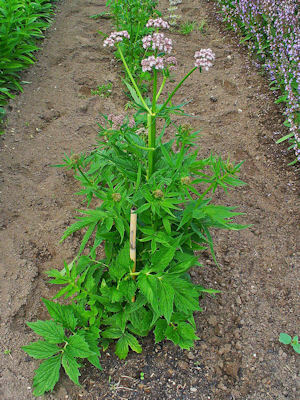 Spring and fall are also the best times to harvest valerian's roots and thin plants as needed. It can get raggedy and neglected looking after a couple of years and benefits from some tough love. Cats enjoy valerian almost as much as they love catnip. Valerian is also reputed to attract vermin like mice and rats. I haven't had problems with that, but cats are a regular presence in my garden, so they may be acting as a natural pest repellent. Although you can propagate this herb from seed, the seeds can be persnickety, so prefer root division or rooted runners. If you really want to try growing valerian from seed: Unlike basil and other hardy herb seeds that can stay viable in storage for years, germination rates for valerian seeds are iffy at the best of times, so get your seeds while they're hot (uh, fresh) and use them soon after purchase. Plant them in rich, well worked, loose soil to a depth of an 1/8 inch or so. Valerian's dried and powdered root is widely used as an over the counter herbal sleep aid, but you can produce your own powder for pennies. 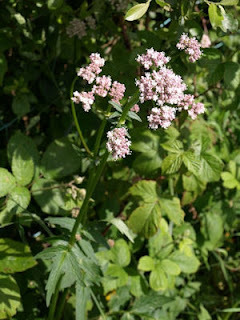 Still, it can be a little sad growing valerian just to dig it up every season for its root crop. (I feel this way about most root herbs, including ginger.) 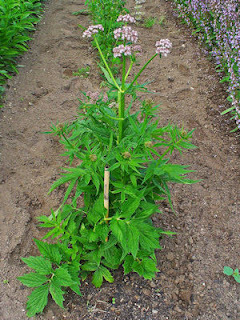 If you grow quite a bit, though, it's easy to harvest a little valerian root and leave a majority of the plant in place. *Valerian root can be a pretty powerful sleep inducer for some, and the potency of the root will vary somewhat from season to season or even from bottle to bottle when sold at the pharmacy. This can make determining the right dosage a challenge. The general wisdom is that the dryer the soil the plant is grown in, the more concentrated and potent the root's essential oils will be. A more mild option, especially if you haven't tried valerian before, is to use the leaves in a sleepy time tea. (The leaves aren't as potent or smelly as the root.) I typically harvest some root and lots of leaves. For valerian tea, I also include lemon balm and passionflower in the mixture. Both are also sleep aids, and together they taste more appealing than valerian alone. Hops is another good addition. As an herbal trinity for night time relief, valerian (leaves and roots), passionflower leaves and lemon balm (all parts) are pretty reliable. All are also easy to grow, dry, store and use. My motto is: If you have space in your garden, use it to grow something useful. Make the landscape work for you. I've also found over the years that the search for a safe sleep aid is what often sparks a beginning interest in herbal remedies. If you want to grow a few medicine cabinet ingredients in your backyard, valerian is a good place to start. I should also mention that there's another common garden plant, Centranthus ruber, known as red valerian. It's a different plant that does not have the curative properties of Valeriana officinalis. It does have a few limited culinary applications: Its young leaves are sometimes used in salads, and the roots are edible. As with any plants you plan on consuming, know what you're growing and harvesting. Over the years, valerian has developed a folk reputation as a kind of herbal wonder plant that can do it all. You've seen above that one of its common names is all-heal. The science hasn't caught up with that anecdotal reputation, though. There does appear to be some support for the belief that valerian is an effective treatment for insomnia. It isn't a knockout herb that will have you snoring in 15 minutes. It takes from 30 minutes to 2 hours to feel the effects, which exhibit as a relaxed, drowsy feeling. 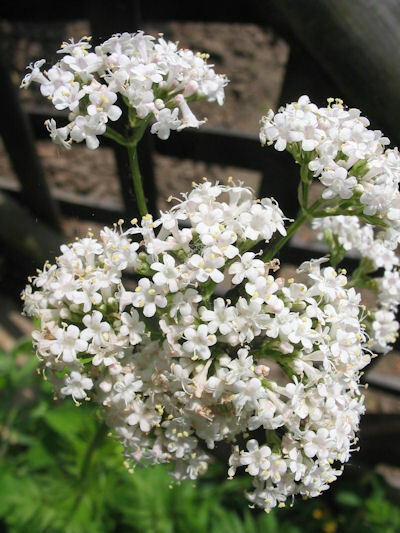 *Valerian is generally considered safe, but taking it is contraindicated if you are pregnant or nursing. It may be habit forming and should be used for brief periods only. The upper limit seems to be 25 days or so for adults, but verify that with the latest research, please. It is not recommended for very young children, and may cause drug interactions with alcohol, Alprazolam (Xanax) and any number of sedative medications. Valerian should not be taken within two weeks of surgery as it may interact with anesthetics and other medicines. 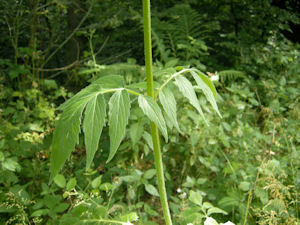 Valerian may also react with drugs that are changed in the liver. For the latest information about this or any other herb, visit MedLine Plus (a service of the U.S. Department of Health and Human Services), The National Institutes of Health and WebMd. Discuss any medical conditions or symptoms you have with a medical professional before adopting or changing your course of treatment. I have an aunt with sleep disturbances. She regularly drinks valerian tea. It has helped her alot. It does smell bad though!!! i use a valerian supplement pill, it stinks too! I heard that you should remove the flowers if you want the roots to grow well. Does anyone know if that is true? My valerian is just about to take over. Thanks for the wonderful post! I'm so glad to have found this post, and YOU. My daughter-in-law suggested valerian to me, for my youngest daughter, who suffers from chronic headaches. Being a gardener, I hoped that I could grow it. So happy to discover that it seems to be an no-brainer to add to my herb garden! Thanks again! I BOUGHT SOME WHITE VALERIAN SEEDS - PLANTED THEM IN PEAT POTS - KEEP THEM WATERED - BUT THEY DO NOT GROW MORE THAN AND INCH HIGH - IN THE KITCHEN WINDOW FOR AT LEAST THREE MONTHS - HOW DO I GET THEMM TO GROW TALLER? The reason the FDA cannot approve plants, like they can synthetic medicine, is because plant chemistry is too complex, even in plants of the same species. I too, do not agree with what the FDA does.... I am just explaining why they do not approve any herbals, it requires too much work. Valerian has helped tremendously with my son with ASD, we are trying to keep him off benzodiapins for as long as possible. I was told by a nutritionist to use valerian for two weeks then switch to something like kava kava. If memory serves me correctly, the synthetic version of Valerian is Valium. Having said that, I am NOT an expert, always consult your doctor before starting an herbal.